Stibbard is a small village and parish situated some 5km to the southeast of Fakenham, just off the A1067. It has an area of 665 hectares and is largely agricultural, although the River Wensum does form the parish boundary to the very south. The meaning of the name ‘Stibbard’ is thought to originate in the Old English words for path by a bank. The parish was enlarged in 1886 when it gained land previously in the parish of Great Ryburgh, and is in the Hundred of Gallow. The earliest object recorded is a Palaeolithic sandstone handaxe (NHER 7137), though a Neolithic or Early Bronze Age arrowhead has also been recovered (NHER 12940). 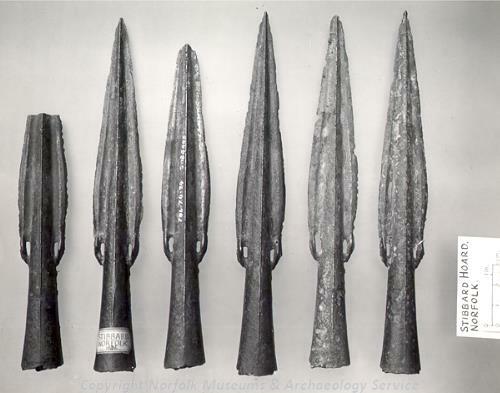 A socketed copper alloy spearhead (NHER 7148) dated to the Late Bronze Age has been recovered, but perhaps most exciting is a hoard (NHER 7147) of some seventy to eighty small Bronze Age copper alloy palstaves and nine to ten spearheads found in 1836. 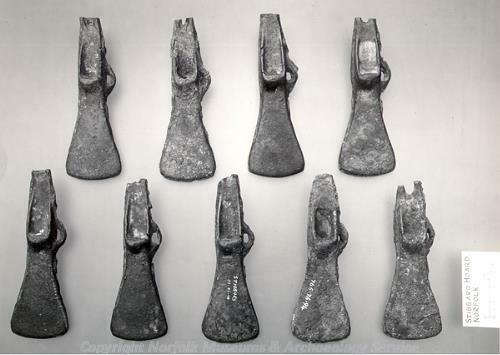 These objects were thought to all have derived from three moulds, and therefore the hoard is thought to have been deposited by a metal worker. Unfortunately very little metal detecting activity has taken place in this parish, and as a result we have little evidence for objects of many periods. This includes the Iron Age, for which no objects or features have been traced in this parish, and only a few pottery sherds have been recovered from the Roman period (NHER 12391). Pottery sherds from the Saxon period have also been noted (NHER 12391), but an exciting 9th century Trewhiddle style silver strap end (NHER 25286) has also been recovered from this area. However Saxon evidence is not limited to this, and some recent fieldwalking has identified a concentration of Late Saxon and medieval pottery sherds in the corner of a field to the east of the parish (NHER 44452), which is thought to indicated a possible settlement site during these periods. It should also be noted that although the entries for Stibbard in the Domesday Book are very small and mention only four free men, it is possible that the current parish church of All Saints (NHER 7158) may have originated in the Late Saxon period. The main structure of the church dates to around 1340, although both the tower and the nave may have earlier origins. The most important and interesting feature of this building is the intriguing east window, where intersecting tracery builds gradually to a full quatrefoil circle. Inside, a number of reused medieval stone pieces can be seen, including an angel-carved corbel in use as an image niche. Medieval sites are limited to the potential occupation site mentioned above, though a small number of objects have been recovered. These comprise a small number of pottery sherds (NHER 7149, NHER 12391) and a medieval gold ring and medieval copper alloy signet ring (NHER 13205). Although there is no recorded medieval manor or hall in this parish, the post medieval Sennowe Hall (NHER 7157) is known to incorporate the end of an earlier house. The current hall dates from 1905 to 1907, and was designed by Skipper in the style of Blomfield. The central part of the east front has giant Corinthian pilasters, as well as full height statues by Italian sculptors, and the kitchen court has a triumphal arch entrance. Associated with the hall is Sennowe Park (NHER 30487), the only Edwardian Italianate garden in Norfolk, as well as Sennowe Hall Clock Tower (NHER 47230), a five storey high free standing Italianate Campanile clock and water tower. Also of architectural interest is The Vale (NHER 19781) a red brick double pile house of the early 17th century, as well as three cottages just 300m to the south, which were converted from an early 18th century barn (NHER 47750). Two farmhouses stand out, comprising The Grove (NHER 29847), an 18th century farmhouse of Flemish bond with Dutch gables, and Holly Farmhouse, which is a red brick house of five bays dated to 1738. Of more recent date is the Methodist Chapel (NHER 33514), built in 1910 of red brick. It has an interesting red brick or terracotta east window in a Decorated style, and is thought to be very similar to the now demolished Sprowston Road Methodist Chapel in Norwich.